Why was it called the Two Sicilies? The triskelion, the symbol of Sicily. Various rulers of the kingdom of Naples (including the last Bourbon kings before the unification of Italy in 1861) referred to their kingdom as the “Two Sicilies.” Why? The affair was settled on the battlefield when Manfred was killed in 1266 by the Angevin army at the battle of Benevento; the Angevins then became the new rulers of the kingdom of Sicily. So far, there is still only one Sicily, but note that the new French kingdom was set up and supported by, and allied with, the Papacy (the Guelphs). This did not sit well with the Ghibelline supporters of the Empire. from left, top ship] directs the landing. Vatican library. Charles of Anjou then moved the capital of the kingdom of Sicily from Palermo to the city of Naples, which is why Naples has the great Maschio Angioino fortress at the port. It was the first royal palace in the city and was completed in 1282. In March of that same year, an anti-French revolt broke out in Palermo. Historically, the episode is called "The Sicilian Vespers." The Sicilians, no doubt nostalgic for the glorious age of Frederick, offered the Sicilian crown to Peter III of Aragon, whose wife, Constance, was Frederick's granddaughter. 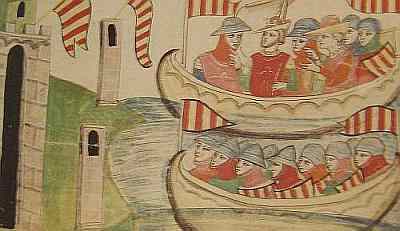 He accepted, and the Aragonese fleet sailed into the port of Trapani on Sicily in August, 1282. The French and the Aragonese were then at war over the island of Sicily. The treaty of Caltabellotta (a small town on the south-west coast of Sicily) in 1302 brought peace and divided the kingdom: the Angevins would rule the mainland as the "Kingdom of Sicily" and the Aragonese would rule the island of Sicily as the "Kingdom of Trinacria" (the ancient Greek name for Sicily. The term means having “three points" and refers to the triangular shape of the island. Trinacria also refers to the still current three-legged symbol, the triskelion, of the island. See top photo). There were now two kingdoms, popularly called "Two Sicilies" (for it is dead certain that Sicilians did NOT start calling themselves “Trinacrians” all of a sudden. After all, they were the real Sicilians!). That divided situation prevailed for almost 150 years. In the 1430s —follow closely!— events in the mainland kingdom of Naples (officially, the Kingdom of Sicily!) led to a power vacuum that the island Kingdom of Trinacria (the real Sicily!) swooped in to fill by going to war with the mainland. 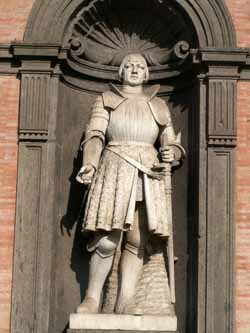 It was the island Aragonese vs the mainland Angevins; the islanders won, and Alfonso of Aragon moved to Naples in 1443. Since Alfonso had reunited the two kingdoms, he designated himself rex Utriusque Siciliae (king of both Sicilies) commonly called the Two Sicilies. Voilà. The term quickly became an anachronism, as subsequent Spanish rulers referred to their Neapolitan vice-realm as "Naples." Even the early Bourbon usage preferred the "Kingdom of Naples." It was not until 1815, after the Napoleonic Wars, that the restored King Ferdinand IV of Naples started to style himself as "Ferndinand I of the Kingdom of the Two Sicilies." He wasn't too bright, and maybe he thought it sounded bigger that way.